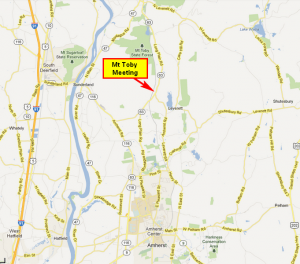 Mount Toby Friends Meeting is located at 194 Long Plain Road (Route 63) in Leverett, MA, north of the town of Amherst. Click image to view larger (Back button to get back to this page). From the north and east: Drive about 9.6 miles south on Route 63 from the Millers River bridge in Millers Falls. Just after a railroad crossing bridge, look for the Meetinghouse on the right. If you come to a sign pointing to Leverett Center (at Depot Road), go back a short way to the Meetinghouse. From the north and west: cross the Connecticut River on the Blue Bridge in Sunderland and continue on Route 116 about 2.4 miles from the bridge, where Bull Hill Road goes uphill to the left. Take Bull Hill Road to its end at Route 63. Turn left there, pass by Depot Road on the right, and watch for the Meetinghouse on the left 1/3 of a mile beyond. From Northampton, or the south and west: take Route 9 across the Connecticut River on the Coolidge Bridge, go about 4 1/2 miles on Route 9, then turn left onto Route 116. Continue north on Route 116 for a bit over six miles to Bull Hill Road. Turn right and continue until Bull Hill Road ends at Route 63. Turn left there, pass by Depot Road on the right, and watch for the Meetinghouse on the left 1/3 of a mile beyond.